After writing 17 blog posts about the same problem, it feels a little strange to be finally writing about the solution. To save you looking back to see if there was an underlying pattern I’ll help you out. Life is hectic, stressful and at times damned complicated. We’re constantly running around to fit other people’s schedules. Yes, in some cases that’s called being accommodating, but in most instances it’s because we don’t appear to have any other choice or we don’t want to invest any more time trying to keep to our own schedule. So we move stuff around. When it comes to picking someone that will cut your hair, fix your boiler, groom your dog or do any number of things that we need on a regular basis, why isn’t it to our schedule? Why don’t we come first? The reason is simple – because you don’t know beforehand when these businesses are available. And sometimes they can’t, so you have to get back on Google and find somebody else. We only show you – the customer – businesses that have the time to fit you in. Better still, create an account & we’ll help you follow your favourite businesses and receive notifications when they have slots available (you can turn these notifications on or off when you need them). Who wants to be added to a waiting or cancellation list anyway? We let businesses advertise not only what they do and where they do it… but we add in when they can do it. If you run a small business you are going to want to see the note at the bottom of this page. 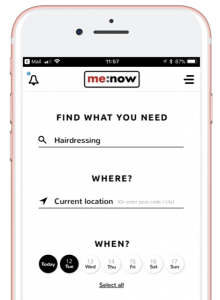 Not only are you in control but you’ll find all those local businesses that you never knew existed and they can let you & other customers know when they’re available. Oh and those recommendations that you can do on Facebook… wouldn’t it be awesome if they came with details of when the business can do the job? So here’s the thing: we’re brand spanking new. We need your help to reach those great businesses that you use all the time and that could use this new kind of tool. The sooner your favourite businesses are using me:now the sooner you can be notified when they have slots available. So, we hope you’ll share this exciting new platform with them. …we’re giving every business that registers by the 31st March 2018, the paid service for free, for 12 months. That’s 30 laser-targeted listings a month for free – for a whole year. Simply, the more businesses that use it, the more choice there is for customers and the more customers that use it, the better it is for businesses. What are you waiting for? Download the app – create an account – take back control of your time!